Firestarters are a year-round need. We use them for fireplaces, fire pits, charcoal grills, and more. 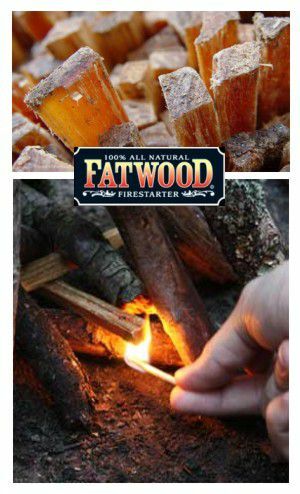 If you are someone that uses firestarters on a regular basis, consider switching to Fatwood firestarters. This natural alternative to chemical infused starters are safe for you and the environment. How are they made? Fatwood is harvested from a portion of pine tree stumps in Central America that are native to that land. This base of the stump is loaded with resins that help this wood to ignite quickly – perfect for a firestarter! How do they work? The flammable nature of the resins inside fatwood create a product that lights quickly and is naturally waterproof. Wet or dry, fatwood works just as well. Gone are the chemicals and additives that our products will use. Gone is the need for smelly kerosene products, or lighter liquid. All you need is 2 sticks and a match… crisscross the sticks and light them with a match and you are good to go!